Summertime….. and the livin’ is easy…. hearing Janis Joplin’s voice crackling and scratching through those words makes it feel like summer. Makes it feel like the livin’ is easy, even when it’s not. A vat of Sangria has that same effect, and it’s exactly what was in order this week. Sangria is easy to drink and easy to make, whether you’re making it for two or a party of twenty, and it’s perfect for a late summer barbecue. The sugar, cinnamon and fruit do wonders for mediocre wine – which also makes this libation on the less-expensive side. 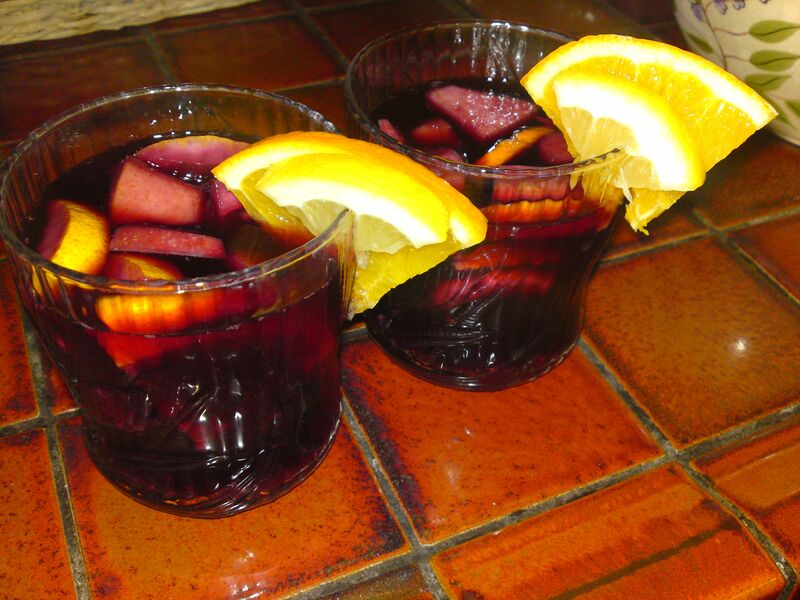 I was introduced to Sangria back in my circus days by my friend Gloria, who always seemed to have Sangria on tap – ready to spice up our lives, cool off a summer’s day, or wash away a frown. Gloria is also the person who sowed the seeds for my love of cooking, so cheers to Gloria – her patience and her Sangria recipe. These ratios are guidelines which can — and should — be adjusted to your taste. I use only one lemon because it’s rare that anyone eats it. The peaches, on the other hand, I double or even triple. (Doesn’t hurt that we have a peach farm down the road.) You might decide to add different types of fruit depending on whether it’s strawberry season or… Gloria would probably give her blessings with one caveat: Of course you can add strawberries or mangoes; just don’t call it Sangria. (Stefano says the same about pineapple on pizza!) As I’ve written before and will write again: Recipes are like friendships; they’re best when they evolve. So make it how you like it. 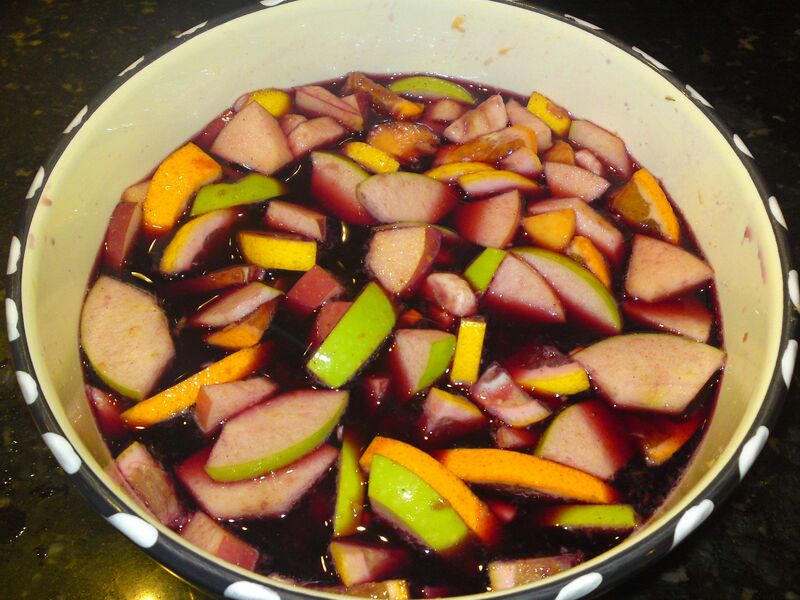 Some prefer their Sangria with less sugar or more cinnamon… you get the picture. Gloria’s wine of choice was Lambrusco, which is light, sweet, and a tad frizzante (bubbly). I’ve used Cabernet, Merlot, Syrah (depends what’s on sale), and I’ve never noticed much of a difference in the finished product – especially by the second or third glass. Peel the bananas and peaches. 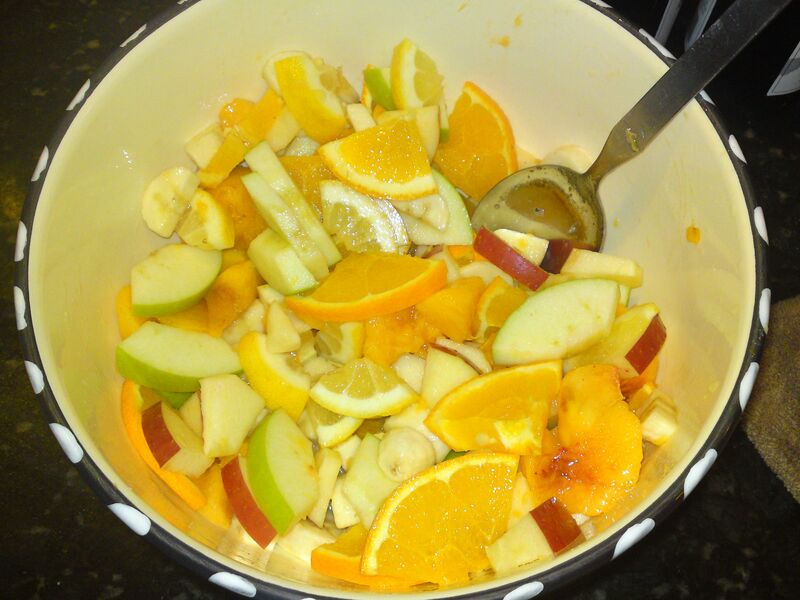 Wash the rest of the fruit using care not to remove all the oils from the citrus peel. Core and pit where necessary, slice into bite-size chunks, and place in a something large enough to hold your fruit and wine. Large glass pitchers or jars show off the fruit; canning pots fit enough for a decent size gathering. Set aside a few citrus slices for garnish if you’d like. When it’s ready, raise a glass to whatever or whomever you’re thankful for — summer, your family and friends. 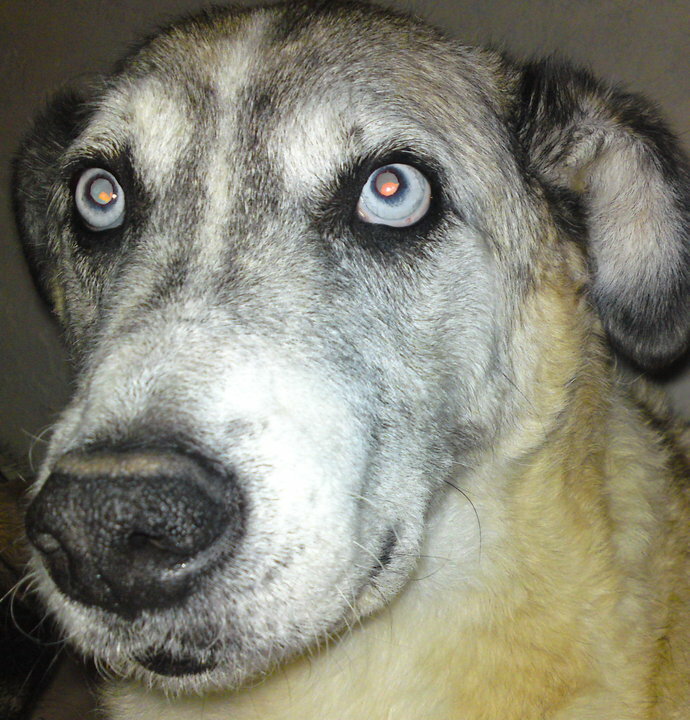 For me, it was the beloved canine companion that Stefano and I had to put down this week. Tough thing to do even when it’s the right thing to do. After all was said and done, I made a batch of Sangria and we raised a glass in honor of the sweetest dog that ever lived. May he rest in peace. Tears for Cody in my imaginary sangria which I drank in with every word. Hugs and thanks for sharing the love in such a special way. ciao to a noble creature. Thanks you two. Appreciate the condolences. Of all the exotic animals we’ve known over the years, few, if any, could take the place of a really good dog like Cody. Good bye Cody. You were such a good dog. I know everyone will miss you. Lots of love to Cody, which he gave and received in huge quantity…and quality. So sorry for your loss, Kathleen and Stefano. 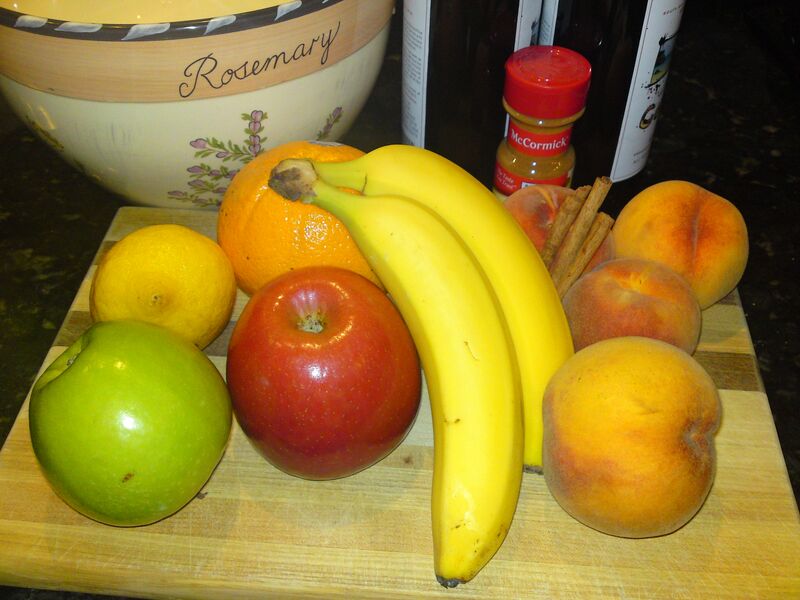 Re: Sangria–Mention must made of the excellent choice (thank you, Kathleen) to replace the peaches with mangoes. OMG! F-A-N-tastic!! I cannot imagine a better summer evening treat, aside from great company to share it with.